trail that category with 150 cc, such as the image below. The 2008 Kawasaki KLX 140 is a Off-Road Style Motorcycle equipped with an 144cc, Air Cooled, Single-Cylinder, SOHC, 4-Stroke Engine and a 5-Speed Manual Transmission. It has a Telescopic Fork Front Suspension while the Rear Suspension consists of a Twin Sided Swing Arm. The KLX 140 has Front Disc Brakes and Rear Disc Brakes. The KLX 140 weighs 194 lbs. and has a ground clearance of 9.3 inches. The KLX 140 was introduced in 2008 and is New for 2008. It includes a 6 month Limited warranty. 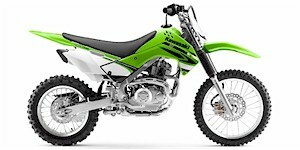 Can you please inform me the dealer for the Kawasaki 150cc in Indonesia and the price.